911uk.com - Porsche Forum : View topic - 997.1 Targa 4 - smiles & frowns - new battery needed?! 911uk.com Forum Index > 997 (2004 - 2012) > 997.1 Targa 4 - smiles & frowns - new battery needed?! Really classy I like the targas one of my favorites, will buy one form one day, is it midnight blue or metalic black. It’s been awesome these bright sunny spring days. Roof back windows down along country lanes, the kids love it. Basalt black with sand beige interior, which even with the roof up it’s so light across the cabin. Thanks great comments and already had some great PMs from other posts with advice and guidance. Great forum. For me it’s my long term daily and have a few plans on where I wanna take it. Might keep updating this thread as other have with there’s. Last night gave the car some love and attention. With full snow foaming, polish, rainX and leather clean. Amazing what you discover when you get really up close and personal with the body work. Tidied a few bits, took care of some stone chips, cared for all the rubber seals, plastic trims and cleared all the drains which means the Hatch back working much smoother now. 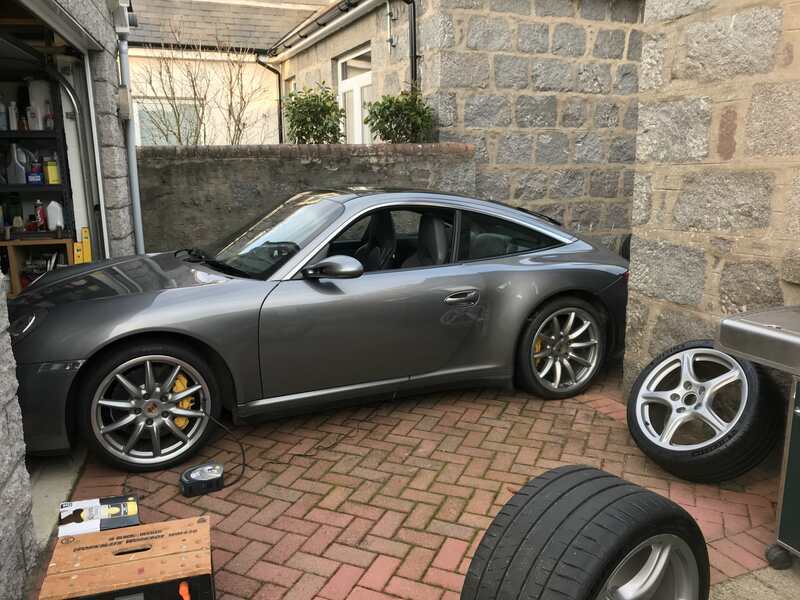 New wheels - thinking will get at least £800 for the Carrera 5 spokes though don’t t see many wide body fitments come up for sale. After sport classic or sport design. Respray - or dare I say it a Wrap? I know the colour I’m looking for but noticed some aging lacquer so think wrap would leave damage if it needed to come off. New stereo - the PCM even with BT add on and DAB is getting me by but miss the creature comforts of a newer head unit. Glad you are enjoying your Targa. I bought one in 2017, there are defo some noises around the roof area, even the sun visors make a noise (probably std Carrera's do that?). Also the position of the sunroof screen makes a difference. I almost feel that that the roof needs to be used, the longer it stays closed the more noises it makes. But TBH this is only on super bumpy roads, normally fine. You mentioned wheels, I bought some Sports while the Classics went to Chris as Exel Wheels (much recommended), very easy to use even far away in Aberdeen. Like the interior and photos. Enjoy the Targa and the w/e weather look good. Cheers JB. Definitely roof down when ever possible, the kids love it in the back too. Yours looks great. Love the seal grey as was on my list. This one came up locally and got a good price. Had it all serviced, belts, Tip box and brakes. Do you have ceramic brakes? Hadn’t driven the car in about a week and the battery was dead again. Ordered a Bosch s5 007 to replace the s4 007 in there. Looking now maybe should have gone for the s5 010 for larger capacity capacity. Any thought idea on this see people have a s5 007 and 010? Also any tips on fitting? I see some saying put key in position 1 others say just disconnect the fitting clamp then negative and the positive. PSM failure might show but drive straight for a bit. 997 and you don't need the key in the ignition .. you can have it position one if you want but unnecessary to have the dash lights on . undo the neg terminal first then the pos , on refitting then pos first THEN neg . Unplug the breather pipe if fitted . Put a towel in the boot and another in front of the battery on the plastic paneling. Climb in and lift the battery onto the towel .. then its easier to lift it out of the car rather than leaning over the wing .. that will just hurt your back ! After fitting , get in and close the doors ..
Close each window and hold the window in the up position for 5 seconds to reset the position for one touch to work . Drive over 6 mph and the psm light will go out and not return . Is it actually a battery fault or something discharging the battery is the question though .. need an amp meter to check that .. instructions if needed for that check .. let me know . As ever deMort help of the highest calibre! S4 007 is what’s in a s S5 007 going in. Though should have probably put the 010 in as it’s the bigger 315mm one. Europarys delivered it in about 2 hours. I think when I left the car in position 1 for about 6 hours I drained the battery fully and though charged it back up over about 36 hours to 100% not sure it fully recovered. I managed to charge it to get it to 25% and then took it out for a run but didn’t spring to life. Not sure if there is a drain as couldn’t see anything on. I’ve hit a multimeter if there’s anything I should be checking to make sure I don’t have some kinda drain. Battery in, windows re-set, PSM light out and hoping it’s good to go. I've seen anything from 680 to 800 on batterys in these and they all do the job just fine .. a bigger battery just means a larger capacity .. as long as its 80 amp hr then it will be fine .. 70 is for low spec cars but again would do the job .. just a little on the small side . Done now though and will keep an eye on it.